I was finally able to do some pleasure reading and finished Moxie the other day! Today I’m taking some me-time before work because this shift is going to be hectic! Vivian Carter does well in school, she’s quiet, proper, and reliable. Her school is overtaken by the football team and they get to do whatever they want and get away with it. She’s tired of it and she’s tired of being the nice girl who always does the right thing. One day she finds a box amongst her mother’s things and she gets inspired. Soon Moxie is born, and Vivian’s old world is about to change. 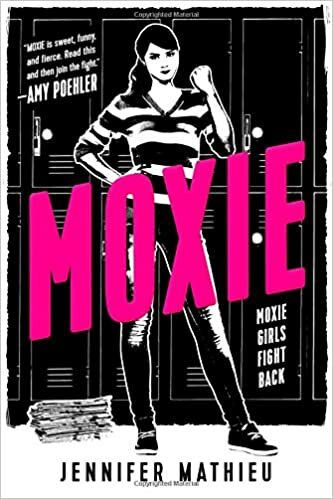 Moxie is a real firework of a book! It is funny and so full of young energy and emotion! Moxie has an important theme, and maybe especially in today’s society. Like the synopsis indicates, we have a revolution on our hands here. In many ways, this book is a good introduction to the world of Feminism. Now personally, I’m careful with using that word simply because I’m not quite sure what it entails. I know the Wikipedia definition of it, and I understand the words used to describe it, but after that, I feel like it is what you make of it like it is with every political ideology. For a newbie like me, this book was both reassuring (because I understood that I hadn’t understood the term incorrectly) and enlightening (because I got a glimpse of how Feminism can be interpreted differently among people). I believe this book is important for both young and old because you’re never done learning. This book will get your brain going and start thinking about how some teenagers, and grown-ups but in this book teenagers, can be a part of maintaining a mindset we should have lost ages ago. What I especially liked in Moxie was how Mathieu has managed to show the clear contrasts between how girls and boys are treated and make it seem so normal! I think that what she describes actually takes place somewhere in the world and that boys are allowed to say and do whatever they want and get away with it because someone turns a blind eye, which isn’t fair. I think those people who do turn a blind eye do those guys a disservice in the long run because I like to believe that someday those guys will meet the world where their comments and actions aren’t acceptable. However, as the book also clearly points out, there are good guys out there and they must be remembered when it seems like the jerks take over. I have one of those guys, and I’m so grateful for him every day! I love how Vivian, the main character grows while we read her story. In the beginning, she is timid and shy with some thoughts that even to herself sounds crazy, but then amazing things start to happen and she dares to take step after step to make a change. I think a lot of young people, both boys, and girls, can recognize themselves in Vivian and relate to what she is thinking and feeling. It has been some years since I was a teenager, but I still feel, and remember the feelings, that she describes. Moxie is a book both youngsters, grown-ups and old should read! It is easy to read, it has some pictures, and the language brings across the message and story of the book in the most amazing way! If you are a newbie to Feminism like me, then maybe and hopefully this book will enrich your limited knowledge of Feminism and what it can be and do. Thank you to my friends @rebella_reads and @readygoread for some inspiration for this review. Go and check out these two amazing ladies on Instagram! They have some great reviews and pictures, you won’t be disappointed! Forrige innlegg 10 books to give your bookworm for Christmas! Neste innlegg Nominated for Mystery Blogger Award tag!